The intent of the instrument is to create a self-generating, dynamic and self-expressing audio creation device. It does this through the use of tubular resonance chambers attached to loudspeakers with a single microphone attached to the latter and inserted into the former. It is strongly encouraged to incorporate some form of signal processing into the chain, as well. 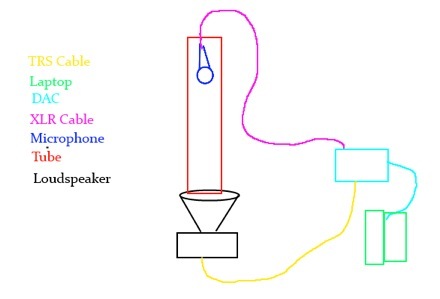 To clarify, the speaker is below the tube, facing upward. This allows for easy manipulation of the microphone’s distance from the loudspeaker, and the resulting resonating length of the enclosure. A limiter in the signal chain is a very important part of the instrument, as without it the feedback volume can be quite unwieldy. To begin with, it is important to discover the nuances of the particular setup of the instrument you are using. Adjusting the volume to a sustainable but reasonable level is the first task. To do this, insert the microphone into the tube far enough that the entire microphone capsule is inside. This should produce a sustainable feedback signal reliably when the volume is set properly – the volume required will probably be lower than anticipated, due to the focusing effect of the tubular enclosure. Once the volume level has been set, it is important to get familiar with the various resonant zones of the tube. Depending on the length and type of tubing used, there will be a number of quite distinct areas of the tube in which the microphone will produce strong resonances around a particular frequency. Most of these can be found within the top third of the tube, and near the center. These allow for some basic frequency control, and switching between them quickly can create some interesting beating effects. To enable quick and easy location of these zones, putting tape on the microphone cable at the exact place is exits the tube when a resonance is found can be very effective. Another key area to understand is the mouth of the tube; feedback can be quickly initiated or terminated by small movements near the tube’s opening. The location of the bottom of the tube (the end nearest the loudspeaker) can affect the sound produced as well. Experiment by orienting this end of the tube near different parts (or different diaphragms entirely, if your loudspeaker has more than one) of the diaphragm. Signal processing changes the feedback sound radically. Understanding what types of signal processing produce interesting effects, as well as sustainable or unsustainable ones is important. I’ve found that pitch shifting effects that change the signal by a given interval quickly terminate the sound. Distortion and high feedback delay processing can thicken the sound immensely. Bit crushing can have some interesting effects as well; however, if the sample rate or depth is reduced by too much, the signal will terminate. Tremolo does not seem to terminate the signal, even at high depth and slow rates – though when pushed to the extremes could produce termination. Experiment with different types of processing, and get to know your particular setup.